There are a handful of iconic athletes that have separated themselves from the "rest of the pack" via their supernatural feats and one of those hallowed stars just happens to be Mickey Charles Mantle! The undisputed "Babe Ruth" of the Post-WWII card market, values for "The Mick's" highly coveted cardboard heirlooms have soared to stratospheric heights with no end seemingly insight. His unparalleled mystique is still an arguable mystery, but one can only assume that his "Goliath-like" un-worldly power was one of the main drivers of his legendary hero stature. Worshiped by millions of fans, Mickey Mantle could hit a baseball harder and further than anyone who ever played the game including Babe Ruth, and even in lieu of a steroid driven environment, still no baseball player can wallop a baseball further than Mantle. Incredibly, the "Commerce Comet" hit two balls off the façade at Yankee Stadium, and his 565-foot home run off Senators hurler Chuck Stobbs at Griffith Stadium in 1953 still stands as the longest official ball ever hit in a Major League game. Ironically, presented here just happens to be a magnificent signed Mantle 1953 Bowman card issued from that fabled 1953 season, one of only 22 signed examples listed on PSA's prestigious "pop" chart (virtually the same number as his hallowed signed 1951 Rookie Card)! 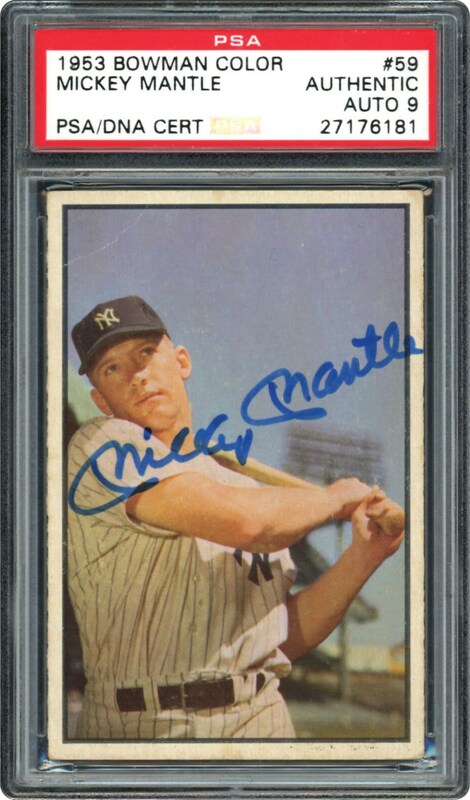 Scripted in bold blue sharpie, the signature literally "jumps" off the card that also portrays stellar eye appeal via the crystal-clear batting image, near-impossible fine centering, and overall VG/EX-EX aesthetics. 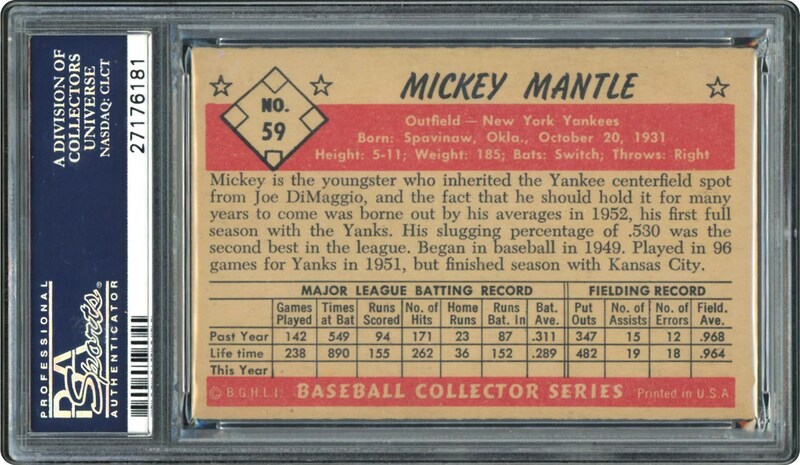 It is no secret that early 1950's Mantle cards are achieving staggering price tags with seemingly each and every sale, with the rising prices of his signed 1950's cards likewise synonymous to an uncontrollable tsunami. Unquestionably, this world-class offering resides as one of the finest scripted Mantle cards extant via its breathtaking aesthetics and sanctified autograph that literally "steals the show!"